I don't use Ebay very often. I go through phases or spells, when I remember that Ebay exists and then I go and do my usual searches. I don't ever look for new stuff (too expensive, probably fake), and I rarely look at all the cool vintage shops, with their carefully selected hipster-wares and hipster styled models. All I do is look for old shoes. See, my whole point for Ebaying is finding all the shoes that I was in love with when I was younger, but didn't have the means or the access to purchasing them. It means that I don't ever buy a lot of stuff (I've been a member since 2001 and have only bought stuff 7 times), but when you hit the jackpot, it's absolute HEAVEN. 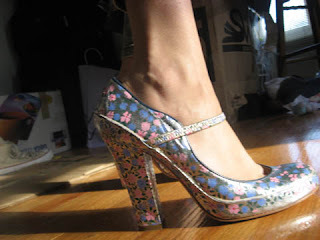 The first stroke of luck came in 2006, when I found my most favorite pair of Miu Miu shoes ever from Spring 2001. Purple, grey and white leather woven mary-janes with a thick beige band going across it. For a mere 80 bucks, I took home a dream. Now, 2 years later, I've struck gold again and finally got my hands (feet?) in these awesome mary-janes from Marc Jacobs' Spring 2005 collection, and for only 70 bucks! I think they go perfect with the looks of this season, as they remind me a bit of Luella Bartley's spring collection and those flowered Dr Martens that I've been swooning over. There's currently a much obsessed-over pair of Miu Miu shoes listed right now that I am keeping my eye on. I'll let you know how it turns out.